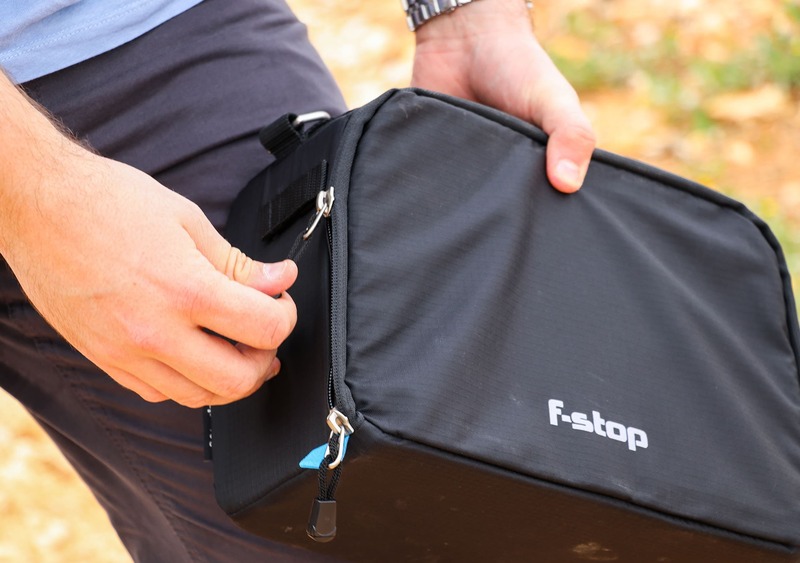 F-stop is the perfect example of a company that focuses on doing one thing well, and that one thing is carry solutions for camera gear. 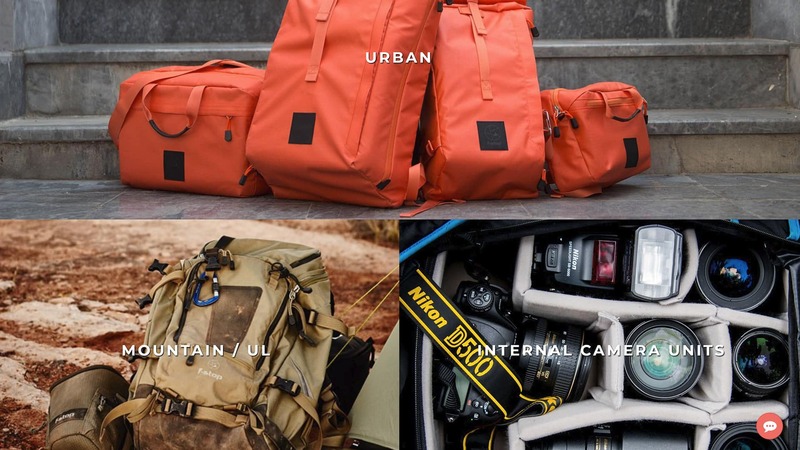 They offer an Urban series for daily carry, a mountain and ultralight series for traveling, and a wide range of internal camera units that are designed to organize, protect and store camera equipment within your pack. We’ve been testing the F-Stop Small Shallow ICU (internal camera unit) for the last 3 months—it’s been on a few trips to Belgium and Spain, as well as a handful of short trips around town. These ICU’s are engineered to function seamlessly with F-Stop’s Mountain Series packs, but the great thing is you don’t need an F-Stop bag to utilize them—they have the ability to turn ANY bag into a camera bag by just dropping one in. This idea, of course, had us really excited. 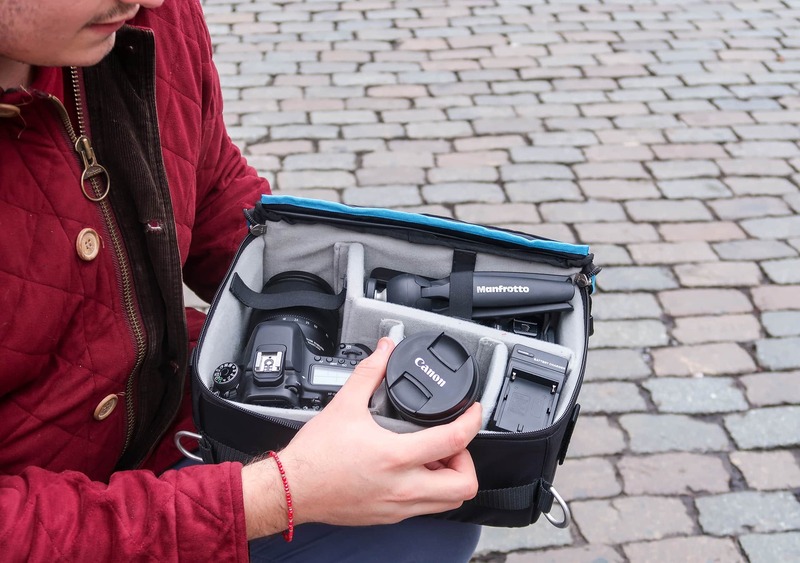 Can you truly turn your backpack into a camera bag just by picking one of these up? Let’s find out. 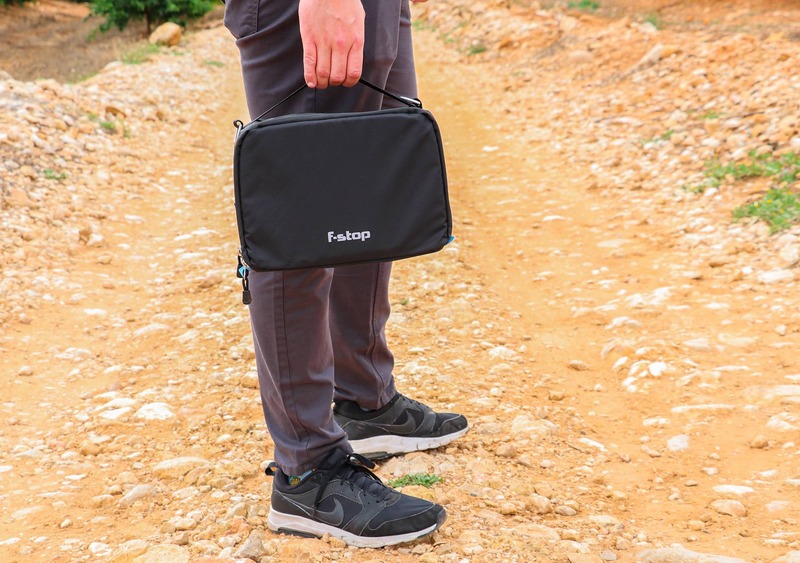 The F-Stop Small Shallow ICU features a sleek, minimal design—it’s really just a box, but a great looking box at that. 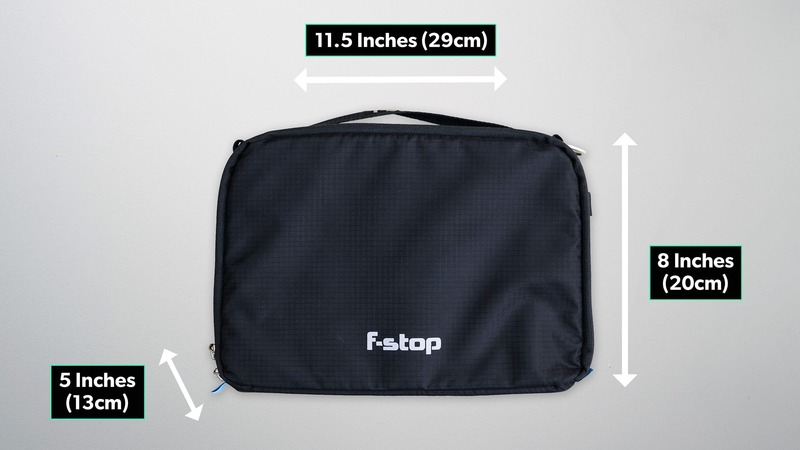 F-Stop only offers one color across all their ICU range, which is—unsurprisingly—black. It’s nondescript and least likely to show any dirt, grime, or stains—which is great! 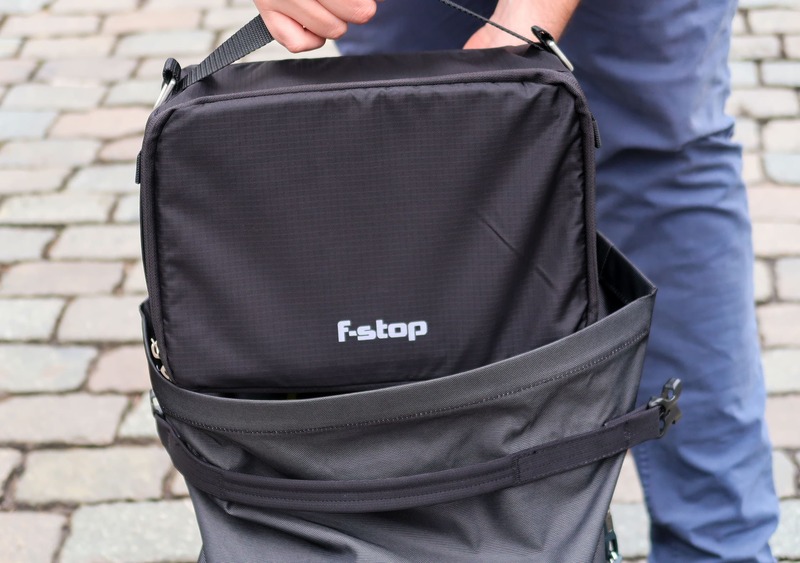 F-Stop offers the ICU in various sizes ranging from a ‘Micro Nano,’ which is perfect for a small mirrorless camera, to a ‘Cine Master’ that will hold everything but the kitchen sink! It’s safe to assume that no matter how much camera gear you have, F-Stop will have you covered. The Small Shallow ICU that we’ve been testing is 11.5 inches (29.2cm) in width, 8 inches (20.3cm) in height and 5 inches (12.7cm) in depth—which we’ve found to be a perfect size for one bag travel. The ICU features a tough, weather resistant ripstop nylon on the outside, high-density cross link foam padding with a brushed polyester lining on the inside, and heavy-duty industrial cross stitching. 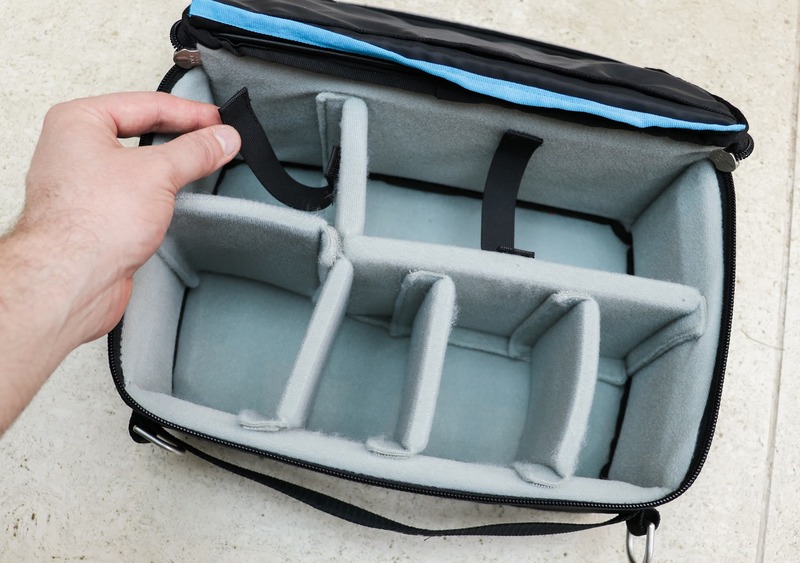 Not only is this thing designed to protect your camera gear, but it’s built to last—and at only 0.71lbs (0.32kg) when empty, it’s also incredibly lightweight. The first thing you’ll notice on the F-Stop ICU is the top handle. This comes in handy when grabbing the ICU out of your bag, and it will lay flat against the unit when not in use—it’s nothing fancy, but does its job well. 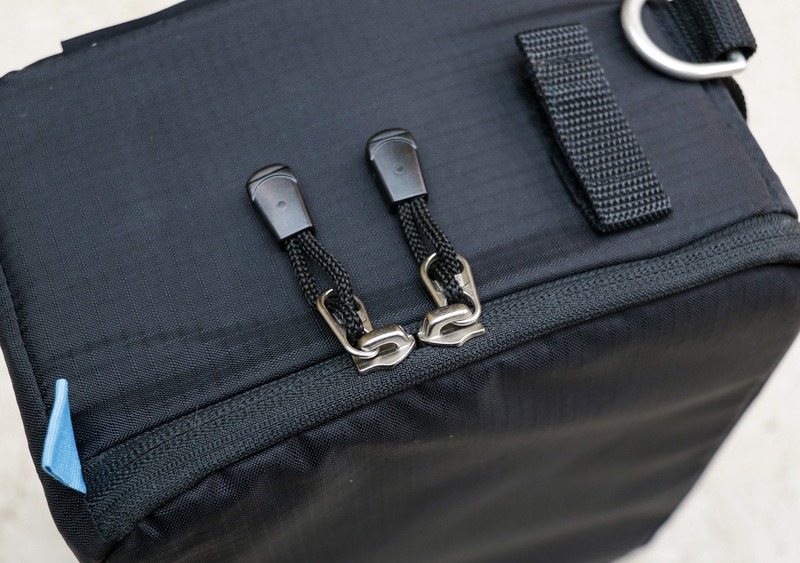 The top handle also features metal d-rings on either side for you to attach a shoulder strap to, creating a messenger bag style carry. This is a nice feature if you ever want to take the ICU out on its own, as opposed to carrying it within a bag—not something you’re likely to do often but it’s great to have the option. Just below the metal d-rings you’ll find a couple of Velcro tabs—these are here to attach the ICU to F-Stop’s mountain series packs. If you have one of these, that’s great… Otherwise they’re rendered useless. We weren’t overly upset about this though, as you don’t really notice them. The zip that opens the main enclosure and covers three-quarters of the entire unit is a nice, chunky YKK 8RCz—the go-to brand for quality zips—ensuring reliability and a smooth opening. The plastic tabs on the zipper pulls are a nice touch too, making them easy to find and grab hold of. Open up the ICU and you’ll find five foam dividers, one long and four short. The idea here is to arrange these in a configuration that best accommodates all of your camera gear. This can be a bit tricky, but the five dividers should be able to handle every scenario you can think of. Even if it takes a little while, you’ll crack it eventually—and it’s worth it once you do. The configuration we came up with actually involved taking two of the small dividers out. We were able to fit everything you would need for a day out shooting—which ended up being a DSLR, two lenses, spare batteries, shotgun mic, lavalier mic, mini tripod and a small LED light. A pretty solid kit for a relatively small bag! 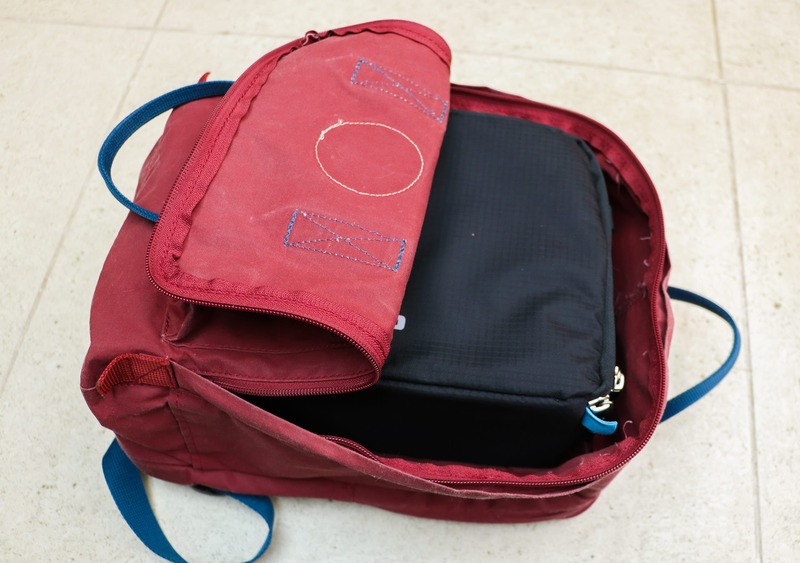 If you do want to carry more gear you can get one of the bigger ICU’s, however we’ve found the Small Shallow ICU to be perfect for one bag travel—anything bigger and you’re going to struggle with having enough room for clothes and other essentials. One thing we’ve been very impressed with is how well the velcro secures the dividers to the brushed polyester material. It can actually be quite tough to remove the velcro—these things are seriously grippy. This all shows just how well-built and well-designed this thing is. You pay premium prices for F-Stop gear but they return the favor by delivering a premium product, which we’re always looking for. 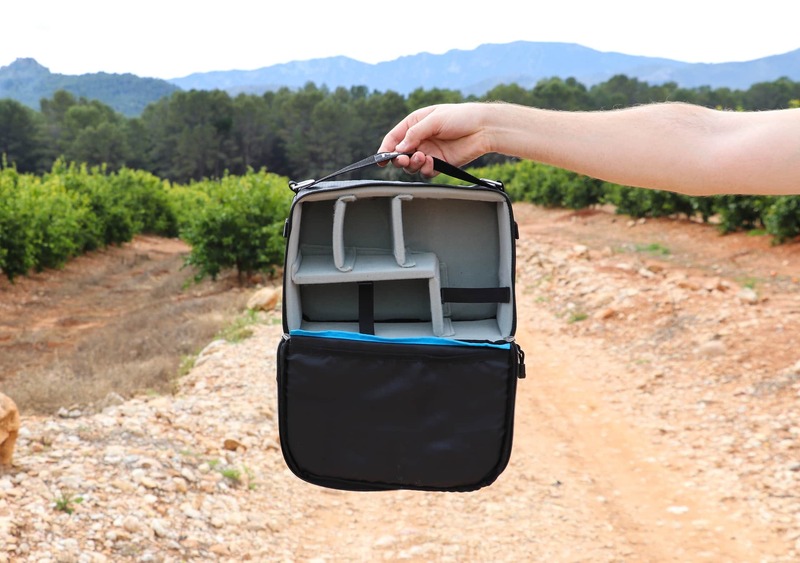 The Small Shallow ICU also comes with two velcro elastic straps that are designed to secure items within the dividers. They are a nice touch but they don’t really seem to do anything. When packed well enough, the items inside ours are pretty secure—maybe these straps come in handy for heavier items in larger ICU’s, but in our case they’re just not needed. 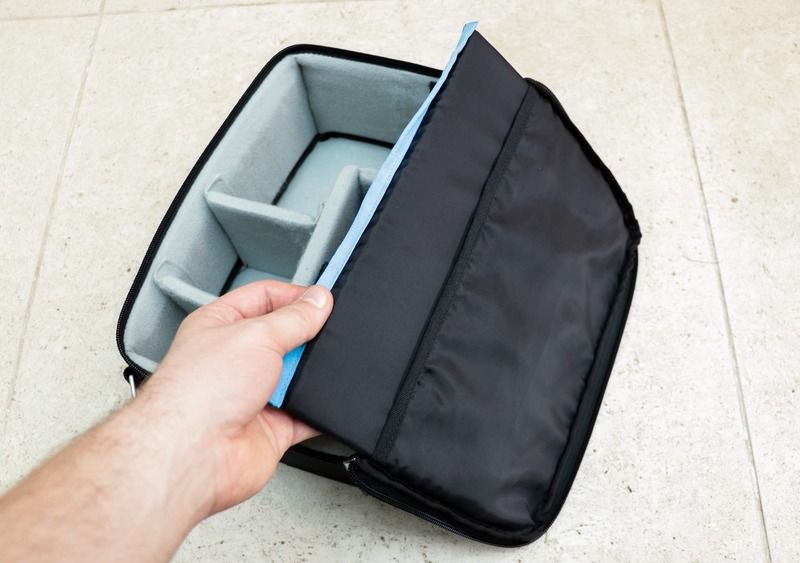 One last little touch that F-Stop has included is the removable foam insert on the top part of the unit. This thoughtful addition increases the protection for your expensive camera gear, and can even be used to kneel on when you’re taking photos. We would have liked to see a zip across the bottom where the insert slides in, as the foam sheet tends to slide out a little when you open the lid. This isn’t a huge gripe, but there’s room for improvement here. The F-Stop Small Shallow ICU is clearly built to last. At the time of this review, we’ve been testing it for about 3 months, but it has held up incredibly well—you could still pass this thing off as brand new. It has also done a solid job of protecting our camera gear—the dividers secure everything tightly so nothing moves around, and the high-density foam puts our mind at ease, knowing our gear is safe in our pack. One downside we’ve found with the ICU is that there’s really no quick access features. If you need to get the shot quickly, this thing won’t be much help—you’ve got to open your bag and then open the ICU just to grab your camera. For most people this won’t be an issue, but for more serious photographers it can be a hassle. If you do need instant quick access there is an easy option—you can buy a mountain series F-Stop pack that has back panel access straight to the ICU. For the casual photographer, the durability and organization that this thing can add to your standard backpack should far outweigh the accessibility problems. The best thing about this ICU is undoubtedly its versatility. You can slot the unit inside your 40L travel bag, 20L daypack, carry it on its own, or just use it for storage. If we’re being honest, our camera gear only leaves the ICU when it’s actually in use. Wow, this velcro is grippy! Love the look of this thing. Still looks brand new & functions well. 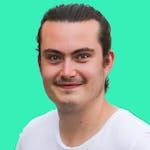 It’s doing great. 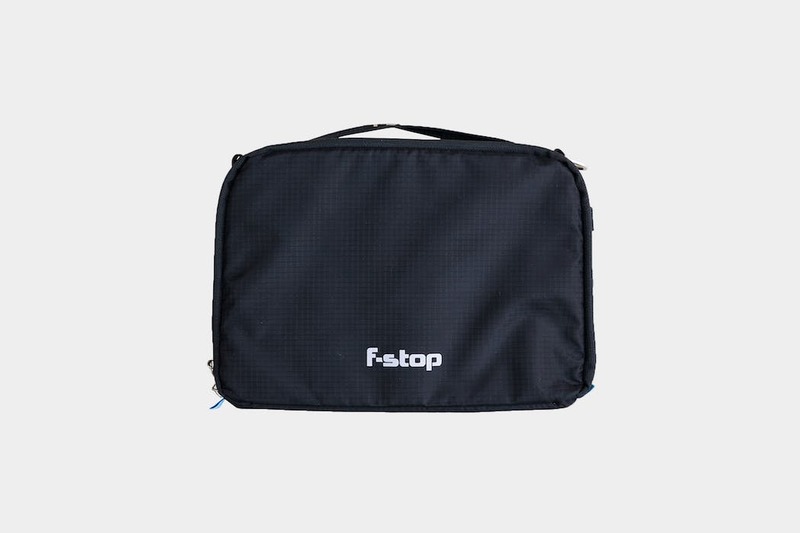 The F-Stop ICU does a great job at organizing and protecting your camera equipment while out on the road, and with the capability of transforming any pack into a camera bag this has become an essential piece of kit that comes along with us whenever we leave the house with a camera. 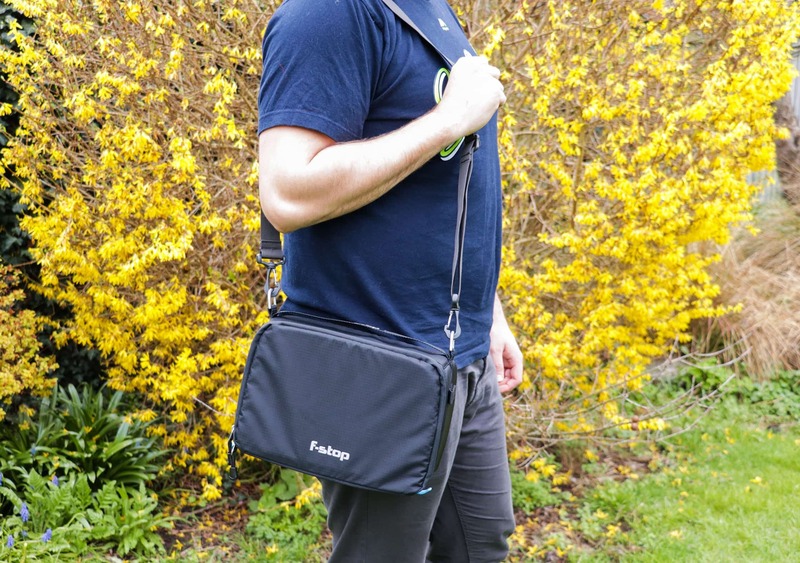 We’ve found the Small Shallow ICU to be perfect for one bag travel, but F-Stop does have you covered with their full range of sizes if you need anything in particular. The heavy-duty industrial cross stitching and water resistant ripstop nylon ensure that this thing is built to last. If you’re looking for a camera-carrying solution, the versatility, durability, and organization offered by the F-Stop ICU is too good to pass up.